Here, the views are simply spectacular from each part of that big canyon! Here, is a haven with high rocky mountains, green valleys, many waterfalls and about kilometre deep curved canyons. Here, everyone can find something for himself, from gentle walks, narrow paths in the cliffs to via ferrates. The highest mountain in area is a Monte Paradido 3355m. The standard route to top starts from Refugio Goriz Sheltter, which is at the very end of Ordessa Canyon. Usually people sleep here (setting the tent is allowed) and start their climb in very morning. The route from Refugio Goriz is strenuous but fairly straightforward. But snow can be found on Perdido until midsummer so it could be essential to bring crampons. I was here only a few days, and I didn’t have a chance to hike / climb all those. 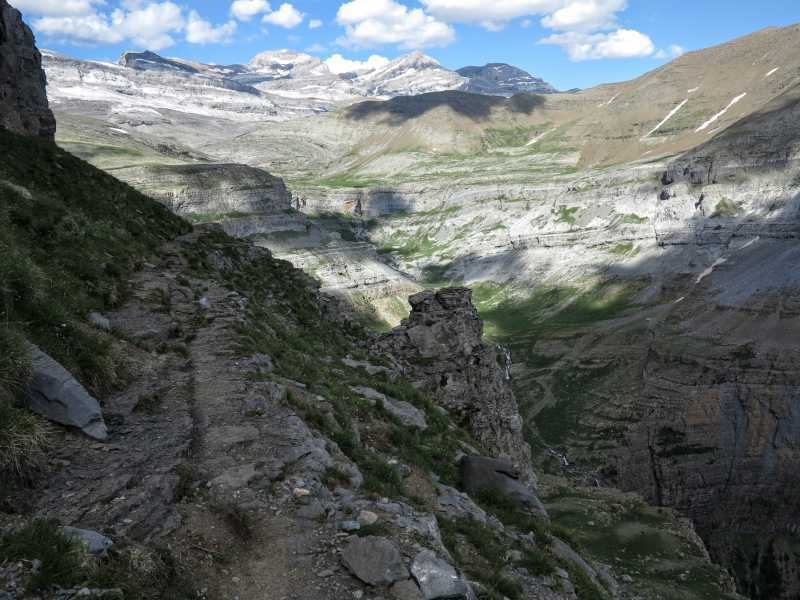 I did hike the Faja de las Flores which is simply tremendous path settled a full kilometre up on the northern cliffs of Ordesa. You need to be there to see the beauty of that hike. Part of that walks is w very narrow trail winding around the cliffs.There is a strenuous ascent of 1,100 metres to get to the start of the path, but it's well worth it! It took me 9h with included time for many photos taking breaks and 2 breaks.